Cher and Dennis Quaid, you have to think twice before you run over the pair again in your head, I remember seeing a similar without the suspense in another of a court room thriller star role played by Al Pacino. But here some unnecessary politics is also thrown over, particular the seduction of the congress women by Dennis. But Cher holds on well to her role and the climax chase by the assassin is shot and edited and paced pretty well. 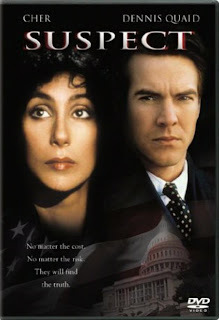 I find the suspense engrossing only to an extent, but the not so hot pair of Cher and Dennis Quaid and not worked upon well and also besides the prime characters the other just hand in there without much of an influence to the script. The film looks more aged than it actually is, and this film could have had more promise, but still it is an enjoyable thriller and the climax with anti-climax the high point of the film. Your honor you stand indicted. Story Plot: One power-play day, a Supreme Court justice hands a woman an envelope, signs a couple of legal papers and calmly blows his brains out. That woman is later found drifting under Key Bridge with her throat cut. Carl, a homeless man (also a dead ringer for Rasputin and given to outbursts of violence) is arrested with the dead woman's purse. And public defender Kathleen Riley (Cher) gets the case. Quaid plays Eddie Sanger, who's lobbying for a crucial House vote on behalf of a milk association. And in a sequence that has no relationship to the story -- except to peek at Washington while it's power-brokering -- he seduces a congresswoman. After getting roped into jury duty for Cher's case, he decides to help her out with investigations of his own -- a legal violation that could jeopardize her whole defense.